Discussion in 'Birthing, Weaning, and Raising Young Goats' started by Pjhobbyfarm, Apr 16, 2019. I am new to goats we just purchased 3 pygmys that are 4 months old. 1 female and 2 neutered males. They are very skittish I am looking for suggestions on how to get them to warmup to us. I am also wondering what treats are safe/not safe for them. Thinly sliced carrots work real well for a healthy treat. Go sit where they are and read a book or just sit there, they will get used to you....hold your hand out with some sliced carrots and let them eat. Soon enough they will come to you for scratches and love when they see you walk into their area, enjoy your new goats ! Rammy, Pjhobbyfarm, AmberLops and 1 other person like this. Welcome glad you joined us! @B&B Happy goats gave you good suggestions! Good luck with your new buddies! Rammy, Pjhobbyfarm, B&B Happy goats and 1 other person like this. I had 2 sheep that were very skittish and I got them used to me by doing the same thing...I sat in the pasture with them and offered them treats. The ram warmed up to me more than the doe but she came around a bit too. 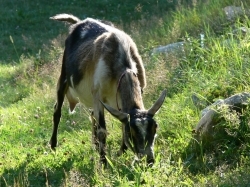 Things goats should NOT eat (to name just a few)……..chocolate, avocados and nightshades. There are many more things goats shouldn't eat! Thanks for the reply. Missy our female is starting to come around and will let us pet her the two boys max and marty will eat from our hand but if we try to touch them they back away. I will do as you said and sit out with them. I love watching them play. Today I will be building them a raised platform so they have a spot to get up and look around and hang out. Think about what your plans are for your goats, ...do you want dairy goats, meat goats , pet goats ? Yepper, bringing a intact buck in with your current group would be a big change.... are you ready for it ? AmberLops, Rammy, Hens and Roos and 1 other person like this.